Create more engaging company meetings and town halls with audience Q&A, polls, and surveys. 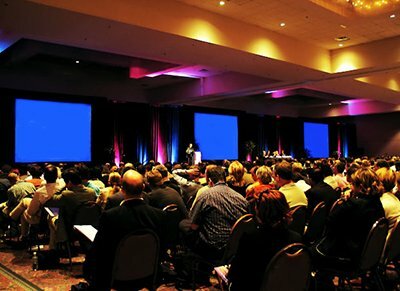 Town hall meetings are a great way to educate and engage employees. They also provide an opportunity to give everyone a voice, but unfortunately the traditional format with microphones and time constraints can make it difficult to get full participation by all. There’s a better way: Mosio. Increase involvement, connect with employees and get real-time responses by offering people another option. One they are comfortable with, one that doesn’t make them stand up in front of a group of co-workers — or their supervisors and executives. 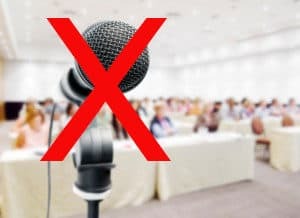 Fear of public speaking, the number one phobia that even surpasses fear of death, makes it difficult for employees to approach the microphone. 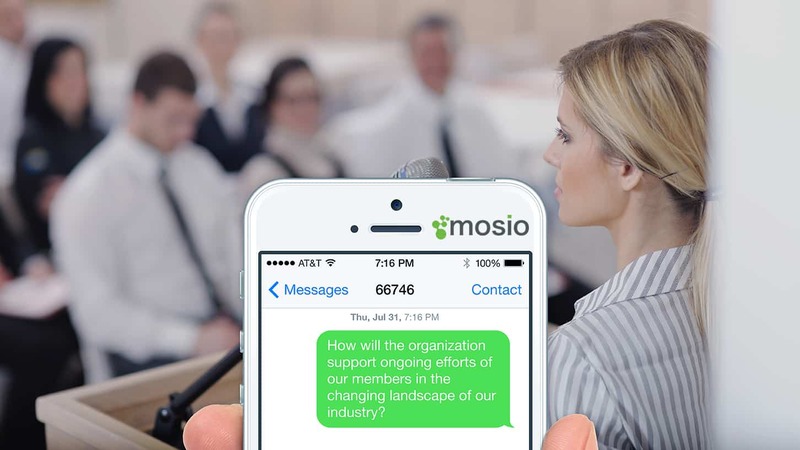 Mosio’s text-to-screen solution provides a way to overcome this barrier and enables all attendees to join the conversation, anonymously without concern of judgment by others. Encourage employees’ participation by asking questions and requesting attendees to give feedback, answer polls or even share photos by texting from their mobile phones. Via an easy-to-use, web-based platform, responses can be reviewed, organized and then displayed on a large projection screen or monitor. Presenters can then answer questions posed, comment on feedback or lead employees in fun, interactive exercises. If there are simply too many questions to answer during the allotted time available, these can be addressed and communicated promptly after the meeting. This is extremely valuable, since the traditional town hall format typically has limited time for interaction and many questions go unasked, and unanswered. See pricing and start your free trial now! Interaction with employees and providing them with easy, comfortable ways to participate in town hall meetings gives them a voice and makes them feel their opinion matters — they matter. As a result, not only do employees get a sense of validation, but the company gains real-time, important feedback and information. According to Pew Research Center’s Internet & American Life Project, 97% of cell phone owners ages 18-29 and 92% of those ages 30-49 use text messaging on their phones. Why not utilize technology employees use every day to boost morale and increase engagement, while also improving processes, solving problems and driving results for the company? Which Companies Use Mosio’s Audience Q&A and Text-to-Screen Services? Brands you know have successfully implemented Mosio’s text-to-screen application at their events. Add your company to the list of brands utilizing Mosio’s solution to improve interaction at town hall meetings and corporate events, boost employee morale and ensure everyone has a voice. Contact us for more information or sign up for a free, 14 day trial now.